If you are reading this, maybe you are already in that role, when your wife is expecting, or you two are planning to get into that phase. Or have you have that experience before and you are in for it for again. No matter whether it’s your first time or second, you have every right to be baffled by the load of it. From now until your baby is born, a lot may happen that no one will have prepared you for ahead of time. There's no way to anticipate every possible scenario, but you can start practicing to be the ideal father even before your baby is born. The thing about men and pregnancy is that there's only so much you can do – the expectant mother really does all the work. Nonetheless, it’s a source of common tension for both husband and wife. Although it’s not really possible to perceive what your wife is going through as she continues to carry the baby to term, you can still participate with her in this nine month journey. You can help her by making time to share the load of her daily activities. You can even cut back on your indulgences and pay attention to giving her extra comfort. Pregnancy is a vulnerable time for a woman. You’ll find your partner feeling sick most of the time in the first trimester. The more time passes, the more risky it becomes for her to lift heavy objects. She’ll constantly be bothered with all the discomforts of pregnancy. She’s already struggling to cope up with her changing body which is making her feel tired all the time. Surely you can make an effort to make her life a little easier. Help her with the daily chores like washing and cleaning – especially the ones where it needs lifting heavy weights. Do the shopping for her – this will also save her from doing the heavy liftings. Help her with the cooking, take part in it – may be you will learn some new recipes too. Your wife is probably worried enough when she’s going for the ANC checkups. The last thing she needs is that she goes alone. Be there to accompany her to the doctor’s chamber, if possible, even if there is someone else to accompany her. That will give her at least some comfort knowing that she’s not alone. As you've probably discovered, your wife has probably become quite moody and emotional. 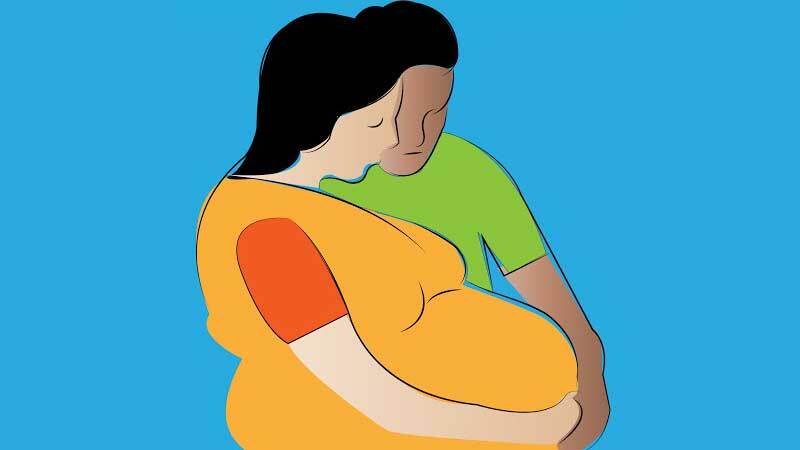 This is something that happens to all pregnant women due to the hormonal and physical changes.Understanding how she feels and behaves at this stage can be challenging sometimes. She might be irritable about things that seem minor to you. A gentle enquiry from you can make a real difference on how she feels. If she’s feeling anxious about something ask her what it is. Make time for her so that she can share her feelings with you. Pay attention. Be supportive. Respect her feelings and opinions. If you need to give her advice, you may want to wait for the time when she’s in a good mood. She’s more likely to take your advice when she’s calm. Talk to her about the roles you will play together as parents. Encourage her to be positive, and she will be if she knows she’ll get your support when she needs it. Your partner is probably trying to improve her diet, cut back on tea, and drink more fluids. You can support her by sharing these lifestyle changes too. Eliminate foods that her restricted for your wife as they may tempt her. Get into the habit of regular exercise. The improved fitness level will be useful when you find yourself running errands when your baby is born. Having a baby means you have some extra expenditure. This include the expenses for the ANC visits and getting better nutrition for the mother-to-be. You should save money for treatment, in case she falls ill. You should also have an amount saved for the expenses during the time of your baby’s birth. Once your baby arrives, you’ll need to buy clothes and diapers for the baby as well. While it may be difficult to guess an amount beforehand, make a budget for the expenses and start saving money accordingly. As your wife approaches the final weeks, make sure that you can be contacted at all times. Make sure your phone is available at all times. Make arrangements for transport to the hospital. Always keep the emergency phone numbers with you like the ones of the doctor, hospital and ambulance services. Make a checklist with your wife of the necessary items for the hospital stay during labor and help her pack the bag. Talk to your employer well ahead so that you can arrange for leave during the time your baby is born. And don’t forget to do one last thing – make a list of blood donors who have the same blood group as your wife’s and keep their numbers with you all the time. This is for being prepared for any emergencies – in case there arises any. So, all set to be a good father? Be a good husband and it’s more than half the work done.